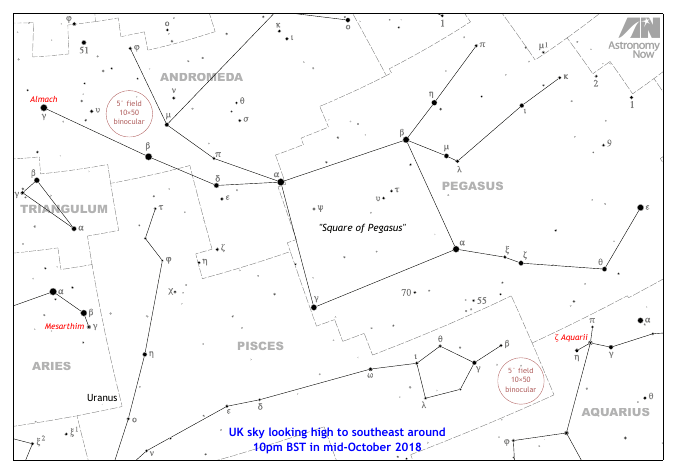 This wide-field view looking high in the UK southeastern sky of mid-October around 10pm local time is about 70 degrees wide, or almost four spans of an outstretched hand at arm’s length. A prominent asterism to get your bearings is the so-called “Square of Pegasus” whose diagonals are roughly the span of an outstretched hand. Two circles show five-degree fields, the amount of sky shown in typical 10×50 binoculars. 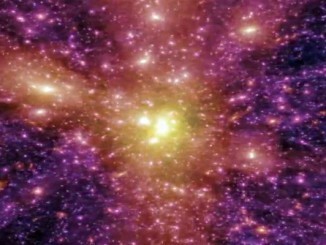 Stars to a naked-eye limit of magnitude +5.7 are shown. The accompanying article describes how to view the three double stars highlighted in red. Click on the graphic for a PDF version suitable for printing. AN graphic by Ade Ashford. 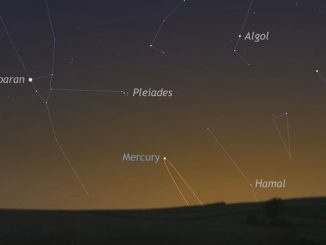 Now that the summer Milky Way and its treasure trove of objects is slowly slipping away to the west at dusk, it’s time to turn our attention to the less showy star groups of the autumn sky. But don’t be dismayed by the lack of prominent naked-eye stars in such constellations as Aquarius, Pegasus or Andromeda. What these star groups lack in luminaries they make up for in numbers of galaxies since we are looking away from the plane of the Milky Way and out into the depths of intergalactic space. As explained in an earlier observing story, around half of the stars in the vicinity of our Sun that appear singular to the naked eye are actually members of double or multiple systems when viewed at magnification through a telescope. Two gravitationally-bound stars, each orbiting their common centre of gravity, is termed a binary pair, whereas an optical double or triple is due to the chance alignment of a nearby star with one or more unrelated stars at differing distances. AN graphic by Ade Ashford. 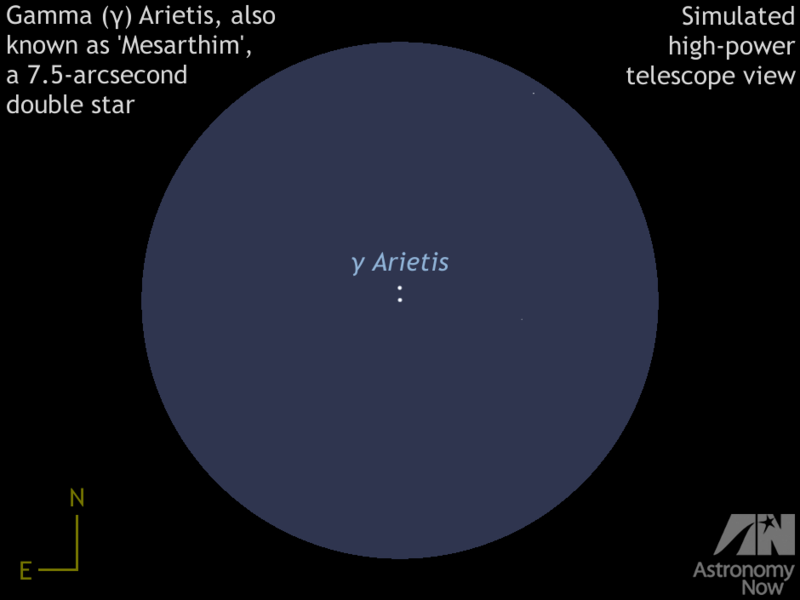 With a combined magnitude of +3.9, gamma (γ1,2) Arietis, commonly known as Mesartim, was discovered to be a beautiful double star with virtually identical white components by Robert Hooke in 1664. With a separation of 7½ arcseconds it’s easy to resolve with small telescopes at a magnification of 75× and above, looking like car headlights in the distance. The stars take about 5,000 years to orbit each other and lie 165 light-years from Earth. If you enjoyed viewing Albireo in the summer sky, then you’ll love gamma (γ) Andromedae. Otherwise known as Almach, gamma Andromedae is another striking double with components of gloriously contrasting colours. Even a small telescope shows the orange primary and blue secondary separated by almost 10 arcseconds at a magnification of about 75×. The fainter companion star is also double in large telescopes at high magnifications when the seeing is good, but it’s a challenge as the separation is only 0.5 arcseconds. Gamma Andromedae was discovered by Johann Tobias Mayer in 1778. The stars lie about 390 light-years from Earth. We finish this small selection of autumn doubles with a much closer pair that is best suited to telescopes of 4-inch (10-cm) aperture and larger at magnifications of around 200× on nights of good seeing. Zeta (ζ1,2) Aquarii has a declination close to zero degrees, so it’s equally observable from both the Northern and Southern Hemisphere. In fact, zeta Aquarii lay in the southern celestial hemisphere until precession brought it north of the celestial equator in late 2003. 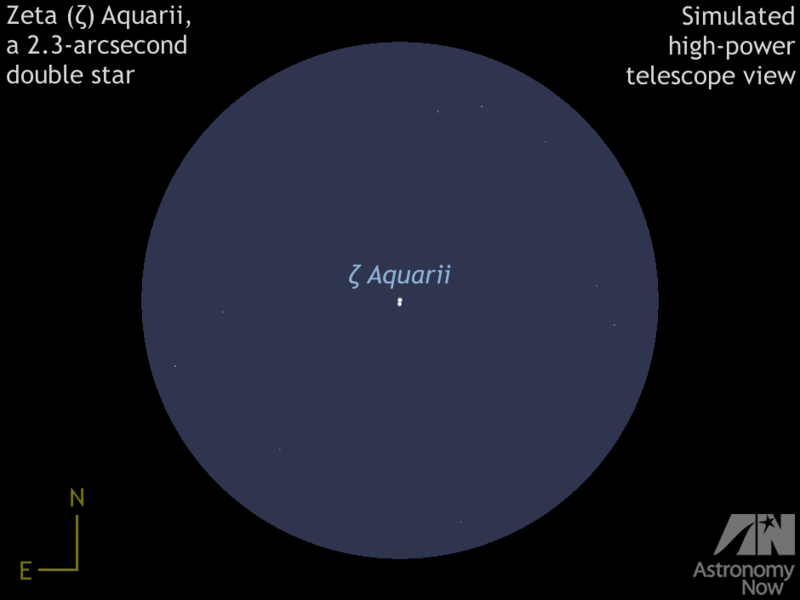 Zeta Aquarii consists of a pair of pure white stars of similar magnitude (+4.3 and +4.5) currently separated by just 2.3 arcseconds, but the separation is increasing very slowly. Zeta2 Aquarii is actually an astrometric binary too close to be resolved in backyard telescopes, so the system is actually a triplet. The stars have a combined visual magnitude of +3.7, an orbital period of about 760 years and lie some 95 light-years from Earth. 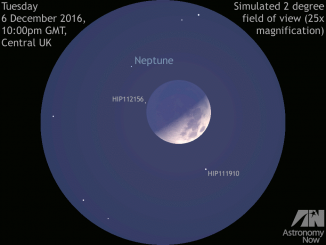 For the seventh and final time this year, the Moon occults outermost planet Neptune on Tuesday 6 December. Weather permitting, this event will be seen over a swathe of the Western Hemisphere including the northeastern USA, eastern Canada, Greenland, Iceland and the western British Isles.